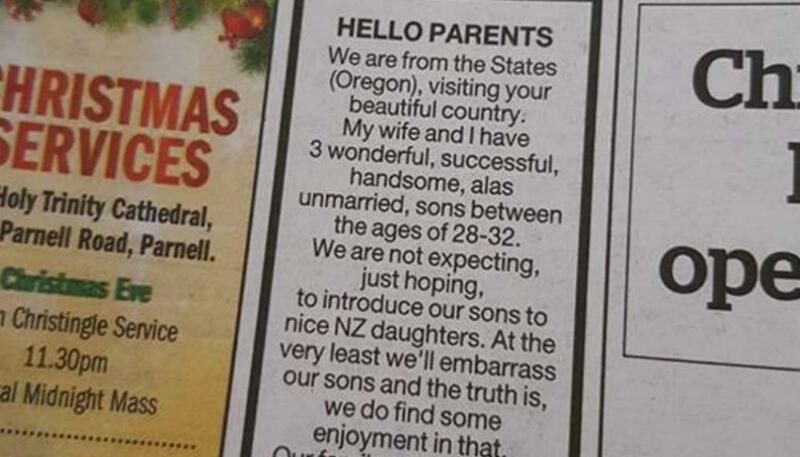 An American couple have paid for an ad to appear in the NZ Herald, appealing for "nice NZ daughters" to date their sons. The classified ad started "Hello Parents. We are from the States (Oregon), visiting your beautiful country. "My wife and I have 3 wonderful, successful, handsome, alas unmarried, sons between the ages of 28-32," the advert reads. "We are not expecting, just hoping, to introduce our sons to nice NZ daughters." The ad goes on to say: "At the very least we'll embarrass our sons and the truth is, we do find some enjoyment in that." The Oregon family will be in New Zealand between December 26 and January 7, and left an email address for anyone who wants to meet them. A photo of the ad has been shared on Facebook multiple times, with people asking if the sons are wealthy and tagging friends who may want to get in on the opportunity.